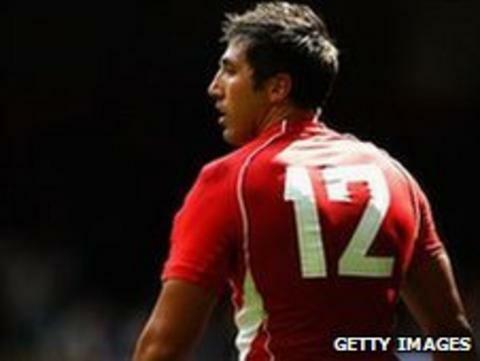 Wales coach Warren Gatland has named Gavin Henson and Gareth Delve in a 45-man preliminary World Cup squad. Henson made his first Wales appearance for two years in Saturday's 28-31 loss to the Barbarians and seems to have done enough to earn another chance. Melbourne Rebels vice-captain Delve has not played for Wales since March 2010, a 27-12 Six Nations loss in Ireland. There is also a place for fellow back-row Martyn Williams, who played for the Barbarians on Saturday against Wales. New Sale Sharks back-row Andy Powell is also included, while Newport Gwent Dragons' Jason Tovey is one of four fly-halves named alongside Scarlets pair Stephen Jones and Rhys Priestland, plus new Perpignan recruit James Hook. That means there is no place for Ospreys number 10 Dan Biggar, while his regional colleague lock Ian Gough also misses out. There is also no recall for new Wasps stand-off Nick Robinson, despite his good season in the colours of Gloucester. Alongside Tovey, the other uncapped players in the squad are Scarlets lock Lou Reed and Ospreys flanker Justin Tipuric, with all 22 players who featured against the Baa-Baas being included in the party. The training squad will assemble at the Welsh Rugby Union National Centre of Excellence at the Vale Resort, Hensol, between 13 June and 20 June to begin World Cup preparations in earnest. They will then embark on two separate training camps in Spala, Poland, from 2 July to 11 July and from 18 July to 26 July, with players selected for these camps based on their individual training requirements. The squad will provide the match-day 22s for three Tests in August, where Wales will face England twice and then Argentina. Gatland will then trim the 45 hopefuls down to a 30-man World Cup squad by 22 August, which he will then take to New Zealand for September's tournament. Huw Bennett (Ospreys), Lloyd Burns (Dragons), Richard Hibbard (Ospreys), Matthew Rees (Scarlets); Scott Andrews (Cardiff Blues), Ryan Bevington (Ospreys), Paul James (Ospreys), Gethin Jenkins (Cardiff Blues), Adam Jones (Ospreys), Craig Mitchell (Exeter Chiefs), John Yapp (Cardiff Blues); Luke Charteris (Dragons), Bradley Davies (Blues), Alun Wyn Jones (Ospreys), Lou Reed (Scarlets); Gareth Delve (Melbourne Rebels), Toby Faletau (Dragons), Ryan Jones (Ospreys), Dan Lydiate (Dragons), Rob McCusker (Scarlets), Andy Powell (Sale Sharks), Jonathan Thomas (Ospreys), Justin Tipuric (Ospreys), Josh Turnbull (Scarlets), Sam Warburton (Blues), Martyn Williams (Blues). Tavis Knoyle (Scarlets), Dwayne Peel (Sale Sharks), Mike Phillips (Ospreys), Richie Rees (Blues); Stephen Jones (Scarlets), Rhys Priestland (Scarlets), Jason Tovey (Dragons), James Hook (Perpigan); Andrew Bishop (Ospreys), Jonathan Davies (Scarlets), Gavin Henson (Unattached), Jamie Roberts (Blues); George North (Scarlets), Aled Brew (Dragons), Morgan Stoddart (Scarlets), Scott Williams (Scarlets), Shane Williams (Ospreys); Lee Byrne (Clermont Auvergne), Leigh Halfpenny (Blues).